When Carol Sacks, a Twitter friend (@casacks but really #mrskravitz,) visited her family in DC, we had the chance to share an exquisite lunch at Jaleo. I brought her a jar of my chocolate raspberry sauce. After lunch, she returned to her parents’ house and opened the jar, offering a taste to her father. It wasn’t long before Carol sent me a message – will you share your recipe with my Dad? How could I say no? Especially when I learned Mr. Sacks was a food preservationist! While he doesn’t actually can, he has a thing for rhubarb, and he freezes containers of the tart sweet goodness every Spring. I’m writing this post with you in mind, Al. I want you to try canning. Just a little boiling water. It’s easy. I’ve written about the basics here. And I’ve got some recipes and even more links to tempt you. As a child, when rhubarb came into season, my mother always made a compote of rhubarb and strawberries, freezing it in one pint containers. We enjoyed that delicious mixture all year long, warmed over ice cream, stirred into plain yogurt, and devoured all by itself. 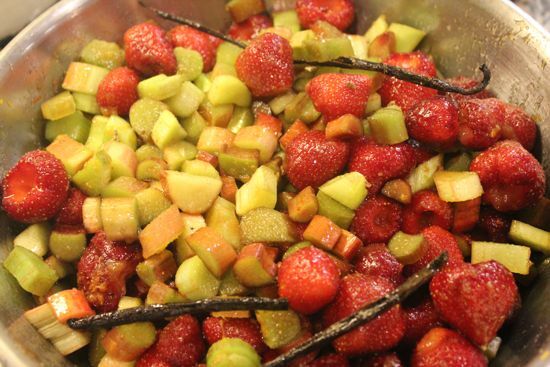 Every Spring, I’m right back in the kitchen, remembering those Spring mornings with my mother, the rhubarb and tiny strawberries purchased at a roadside stand, chopping and stirring, the mixture bubbling on the stove, the canning kettle clanking and steaming away. Savoring the tang, the sweet, the sour, the taste of Spring. Al Sacks has his rhubarb memories. I have mine. And when, Merrill Stubbs published a wine scented rhubarb compote on Food52, I wondered how many of you might have rhubarb memories. Is this a trend? Is an old-fashioned flavor just back in favor? Not in this house. It’s a passion. 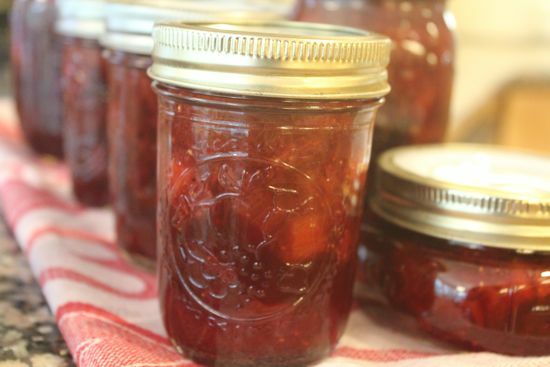 While toiling in the kitchen, this rhubarb syrup from Food in Jars was just the ticket. A tablespoon or two in a glass of seltzer was refreshing and not too sweet. I’ve frozen two half-pints of this syrup for summer drinks. Add a shot of vodka and a squeeze of lime for a sultry summer cocktail. Have you had your rhubarb today? Here are six ways to enjoy it. I made this recipe with my friends Capie and Jess in mind. I know Jess loves rhubarb, and, as they’re off to a three year posting in Turkey – a rhubarb-free zone, evidently – I made a couple of jars for their pantry. I like this sauce poured over everything – pound cake, ice cream, yogurt and granola, semifreddo, ricotta – the list goes on. It’s thick for a sauce, but not quite a jam. Oh, no one will look askance if you put some on your toast. Mix together and then macerate all the ingredients in a glass or ceramic bowl overnight or at least 4 hours. Strain the fruit and solids out and set aside. Put your candy thermometer in place, continue to cook and stir, and bring the mixture to 220°. Ladle into sterilized jars, place lids and rings, and process in a boiling water bath for ten minutes. Last year, I made the rhubarb rosemary honey preserves from Mes Confitures. From there, I got thinking about rhubarb and lavender. It’s the natural evolution of a recipe for me – after all I’m landscape designer, gardener and plantswoman, and the botanical similarity of lavender (lavendula) and rosemary (rosmarinus) spurred me to swap them in the recipe. Delicious, heady, and unusual. Thought I was so darn clever, until I realized Tigress, the awesome DIY blogger and creator of the Can Jam, had done it already TWO YEARS AGO. I’m sure she would agree, it’s a wonderful woodsy note next to the tart rhubarb, and simply magnificent as an accompaniment to cheese. I might add almond slivers, toasted, next time. Macerate all the ingredients for at least an hour or as much as overnight. Strain the rhubarb and bring the syrup to a boil. Add in the rhubarb and bring back to a boil. Stir gently and boil for 5 minutes. Ladle into 4 oz jars. Wipe the rims clean. I wanted to make a chutney and I tested three different chutney recipes until I came up with one I liked. We made it at the Food52 get-together,and added the one element it needed – much more ginger! Here is the tweaked, final recipe. Put everything into a non-reactive preserving pot and bring to a boil, stirring constantly. Turn the heat down and simmer, uncovered, stirring regularly and gently, for 45 minutes. 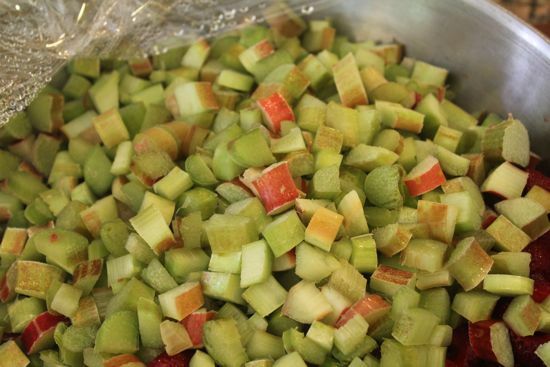 The chutney will get thicker, but try not to let the rhubarb pieces break down too much. Whisk together the clear jel and the sugar. Add to the preserving pot with the water and lemon juice. Stir well to avoid lumps. Bring to a boil stirring the whole time. Add the fruit and cook for five minutes once it returns to a boil. Ladle into clean quart jars. Seal and process for 30 minutes in a boiling water bath. Gooseberries just appeared in the market last week. Their natural pectin is high, so I knew I could take the low pectin rhubarb and strawberries and create a new flavor combination that would have body. At the last minute, I added fresh rose petals for a whisper of floral, just enough. The color is amazing and purply red, lush and what a wonderful smooth texture and tartness. It will suit both savory and sweet, but right now? I’m swooning over a hot buttermilk biscuit, pat of cultured butter and a big spoonful of this now favorite jam. Mix the fruits, sugars and lemon juice and macerate overnight. Strain the fruits and set aside. Bring the liquid to 220°, stirring all the while. Add back the fruit and bring to a full rolling boil for five minutes. Do not stop stirring. 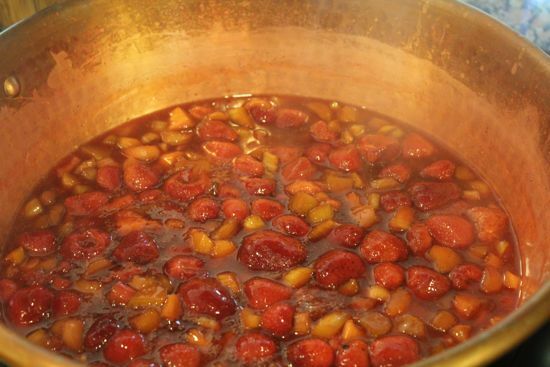 Turn off the heat and let the fruit settle into the hot liquid for 3-4 minutes. Ladle into the prettiest jars you have. Place lids and rings and process for 10 minutes in a boiling water bath. *Topping and tailing is the worst part of gooseberries. Use a sharp kitchen scissor and cut off the top and the tail – or you will get a little tough unpleasantness in every bite. I read several recipes for rhubarb pickles, but it wasn’t until I found this one, that I was inspired. This is not a pickle for everyone. It’s assertive and unusual. I adored it. Others did… and didn’t. It’s easy to make just one jar, so give it a try! Cut rhubarb into batons and stand in a pint jar snugly. Bring the remaining ingredients to a boil, pour into the jars over the rhubarb. The pickle will be ready in about an hour. Even better in a week. Really must try rhubarb, dried cherries and rosewater (tho, truth be told, I’m not a big fan of rosewater, so it might be rose petals) from The Blue Chair Jam Cookbook. I put two pounds of rhubarb, diced, on a sheet pan and froze it (IQF – individually quick frozen.) It’s in a ziplock bag, in the freezer, awaiting further experimentation as other fruits come to market. I’m going to do the same thing with strawberries this weekend. Two pounds. Just in case I want to mix them with plums. Or apricots. I’ve not yet picked up any rhubarb this year, but I will this weekend. 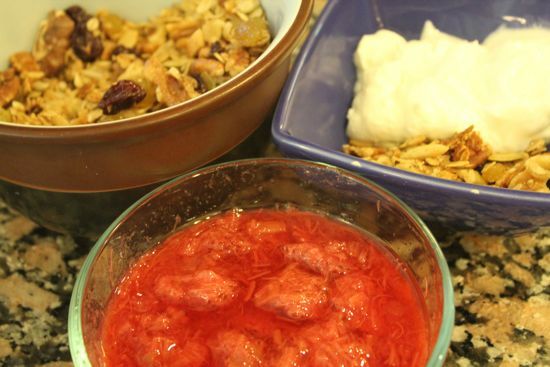 Two of my favorite recipes for it are Rhubarb-Red Wine Sauce – delicious with salmon, and Rhubarb-Grapefruit Marmalade. I think I’ll add to the list your Strawberry-Rhubarb pie in a jar. It’s a terrific idea. wow…real rose petals! Very clever, and delicious I’m sure! And lavender! I love it! Looking forward to giving these recipes a whirl when my rhubarb pops in a few weeks…. I saw rhubarb at the market last week and grabbed a handful. We just made these http://www.food52.com/recipes/4338_rhubarb_curd_shortbread to much delight. Next time I’ll slice fresh strawberries on top after cooling. The rhubarb, cherry, rose sounds good, perhaps with rose jam http://www.emikodavies.com/blog/rose-petal-jam/ in lieu of rose water? We’ll be having more rhubarb for sure! That’s an awesome recipe from the amazing cook, NotDerbyPie. Check out her blog. Many thanks for the rhubarb love! 🙂 I’m now totally ogling your rhubarb-lavender-honey jam…way too many things to try before the season’s up. Cathy, I can’t wait to find some rhubarb at my Farmer’s Market so I can make some of these fabulous recipes. And, you are so sweet to mention my Dad, who will love this post. Sending to him now! I love rhubarb! I have made BBQ sauce out of it and drinks and on and on. It reminds me of my Gram. I need that BBQ sauce recipe, stat. I made some simple rhubarb liqueur this year – soaked about two cups of chopped rhubarb in high proof vodka for two weeks. The flavor is amazing! I have enjoyed it mixed with club soda and in a martini with gin. Yum! How have I never done that? I hope there’s one more week of rhubarb at the market. All these good ideas! You are amazing! But then, we knew that, didn’t we? 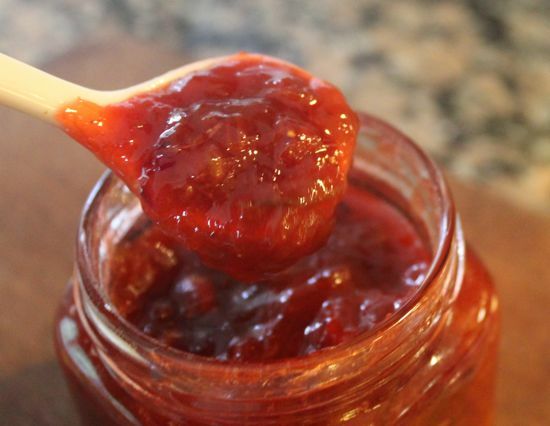 I am a big rhubarb freak–just made a rhubarb rose jam the other day. I think our pictures are almost exactly alike! 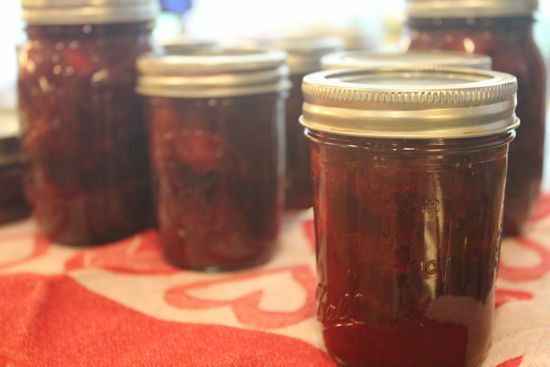 Love the idea of having strawberry rhubarb sauce all year round. I haven’t done much canning, much these idea might make me start. I never did much with rhubarb because it doesn’t grow in my garden (it can act like a weed in north Idaho), but you have inspired me. I have made rose petal jelly and it is divine. I couldn’t bring myself to do anything with it but keep it natural. At this time in my life, my two favorite jellies are crab apple and chokecherry. Wow! Sometime this summer I’m going in for the elderberry. Mostly I want it for syrup. A number of studies have shown that elderberry syrup cuts you healing time in half when you have colds, flus, etc. Plus it tastes delicious. I would love to work with elderberry but it’s nowhere to be found. Cathy, what is culinary lavender? I always just use regular lavender in recipes. I didn’t know there was a variety for cooking. Different lavender varieties are used for different purposes. In my mind, Lavender ‘Grosso’ is more perfumed, while ‘Provence’ tastes better. Also, if you purchase lavender that is marked culinary, you can be assured no sprays were used. Lisa flagged your rhubarb recipes for me because she’s seen me in the kitchen obsessively cutting rhubarb and strawberries for a compote that is like the filling for my Mom’s pie. It’s total comfort food for me. I can’t get enough of it. I add tapioca and very little sugar. Delicious! As for the rhubarb, I got it at the farmer’s market for a few weeks in a row, but there was never enough. So I bought two more plants there. Mine, planted last year, is not doing great. The grower tells me they do best in shade, NOT sun, yet sun is what the growing instructions always say. Can you comment Cathy on growing rhubarb? FEED THEM lots and lots of Manure. and give them LOTS of water. They are hungry little beasties but if you water and feed them you get such a reward. Ours are in full sun, but you could get by with a bit of shade (mom’s were always a bit shaded) the big issue is food and water…. those crisp stalks are full of water, they have to get it somewhere! ecoteri said exactly what I would. I moved our most recent rhubarb patch from shade to sun, and it’s going crazy — it was not doing too well in the shade. Because I live in a remote-ish area, there are many old, long-gone homesteads, but their rhubarb still continues to grow — it’s always in the sun. One also needs to remember *not* to pick it for a couple of seasons after the initial planting; it will often die if picked before this. Our soil is very well drained, which helps keep their feet from getting too wet. Cathy, I have to make one more comment that is a fun memory to share. Growing up in Alberta Canada, rhubarb was one thing that did very very well in our garden and short growing season. We gorged on it. 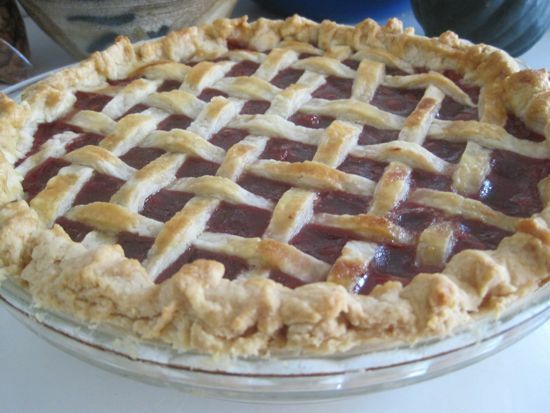 I have fond memories of my mom picking the thick, reddish-green stalks for her pies. If my siblings and I were around, she’d give us each one to dip in sugar and eat, like a sour sweet candy. Heaven! Hi Kathy, My mom used to let us dip raw rhubarb in sugar too. Nice memories! Planting it? I’ve had no luck at all. I put three plants in and the deer chomped them to the crown. This is the third attempt. Tried sun, tried shade. Makes no sense at all, as I know it’s a noxious weed in many places, but I can’t grow it to save my life. Where in the DC area does one get Thai hot chili peppers? I’d love to try the chutney recipe. I grow my chiles every summer. Easy easy easy. Just pop a few plants in pots, window boxes or garden beds. All they want is a lot of water and sunshine. Freeze them whole to use all year round. I have jalapeno, serrano, cayenne, and Thai bird peppers already flourishing. When all else fails, substitute a teaspoon of crushed red pepper. What a nice collection of rhubarb recipes! I think rhubarb is a neglected vegetable/fruit but to me, it symbolizes summer. I remember sitting on the steps of my grandmother’s house with my cousins, rhubarb stalks and a bowl of sugar in hand. FINALLY it is strawberry season in New England, off to make some rhubarb/strawberry jam, can’t get enough of it! p.s. 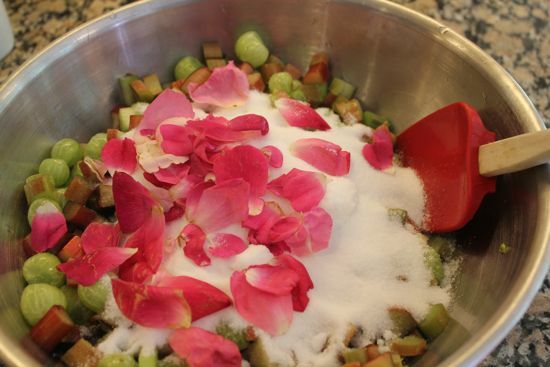 I’m adding these recipes to my recent post about rhubarb. Happy summer! Just returned yesterday from 9 days in Paris where I had an impeccable french pear tart and thought of you. Some other good stuff too, as you might imagine. Look forward to seeing you on the 19th. i’ve been thinking of making an indian-inspired dinner for my book club meeting (we’re reading sea of poppies) and that rhubarb chutney will be a perfect seasonal accompaniment. thank you! Rhubarb heaven! And oddly enough it is currently in season here in NZ! Wow! I cannot quite believe that there are people around who don’t know what rhubarb is!!!! Our rhubarb patch is having a spectacular year this year, and I really do need to get out there and harvest some for the freezer — just wash, chop, and pop into ziplock bags! I also make stewed rhubarb, using no water, just rhubarb and sugar, cooked until soft. I went out to pick some Rhubarb a month ago – and guess what? my Turkey hen was nesting under a leaf. (no kidding, turkeys are STUPID). The leaf was long gone before she produces her 4 babies. Needless to say, I didn’t get much rhubarb this year. (Turkey hens make hardly any noise, but they can hiss in a very determined and scary way, when they are on eggs).